On the beach, yesterday I saw loons, scoters, and oystercatchers. It was amazing as they just happened to appears in just the right spot at just the right time. Or maybe it was me who was in the right spot at the right time. The sun came out so I left the computer to its own devices, grabbed my camera and headed out the door. I decided to go to Whiffin Spit which is just outside of Sooke as you can see on the map below. If you want to see a larger map just click here or just grab your mouse and pull the one above down, you will see a hump right underneath the white box with the writing in it. It was to the hump that I was heading. It was low, low tide and was almost slack. Sometimes you get lucky with these conditions. The parking lot was full, but thanks to someone who just returned from a walk I pulled right into a spot. Good start to the day. It was warm enough that all I needed was a tee shirt, vest and of course pants (although I was thinking of shorts) but just in case I wrapped a jacket around my waist. You just never know. 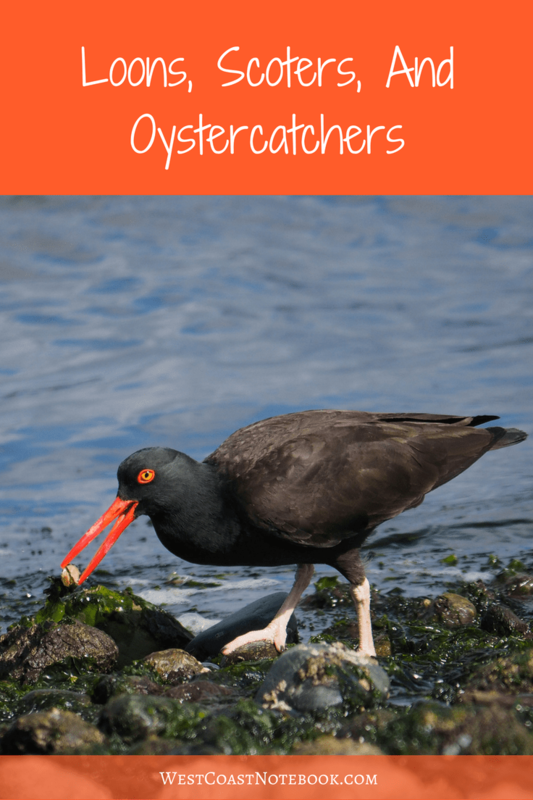 I started down the path and just before the area that looks like an elbow, I spotted a couple of black oystercatchers on the inside of the bay. They were happily munching their way on mollusks along the shoreline heading towards me. I quietly got down on the beach and found a spot well enough ahead of them not to cause them any discomfort and I sat and waited on the rocks. They continued towards me, snacking along the way and they would eye me occasionally but they still kept coming. It is always amazing to me how trusting wild creatures can really be if you mean them no harm. When they came below where I was sitting, they put on a burst of speed and ran in front of me and then stopped again as soon as they were passed. We don’t fool them for a minute. 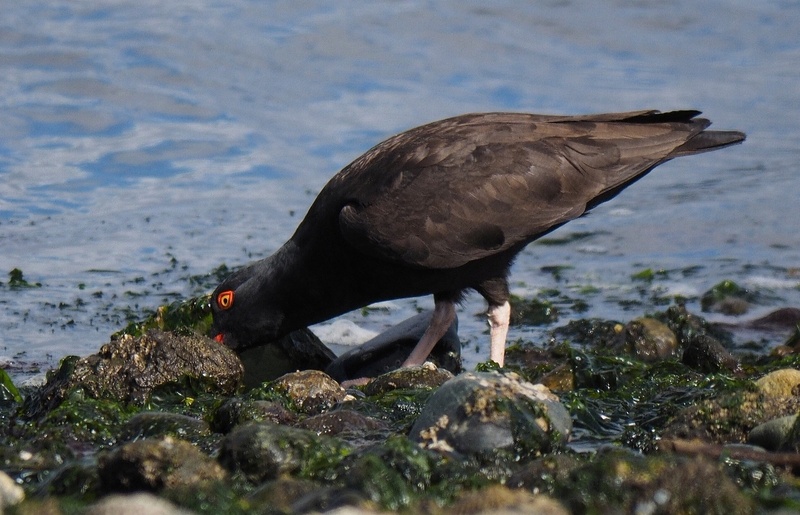 They get their beaks right in between the rocks and find food in places where it looks like nothing exists. And happy days, they come up with food. Don’t you just love the feet on them? 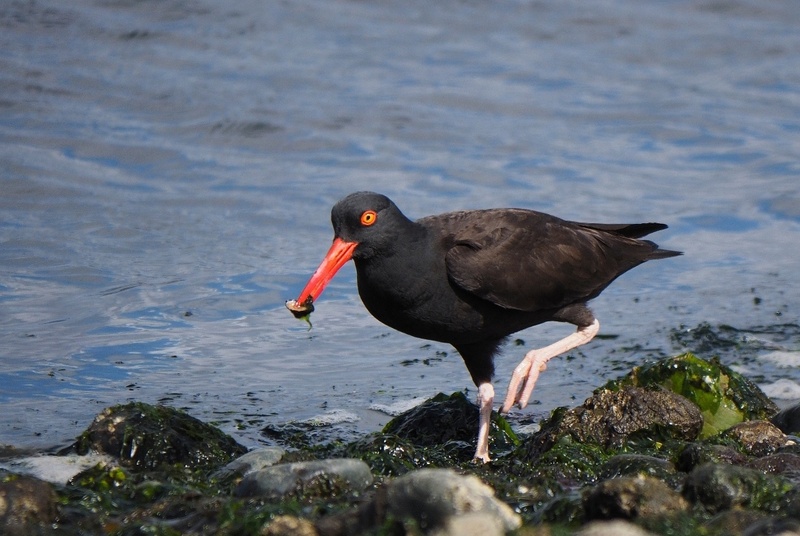 Once I left the oystercatchers to their dinner, I started further down the spit until I came to the hump. The hump is actually a sort of field with lots of driftwood and rocks and I sat at the point on the rocky beach. At this point, you are right at the end of the channel where the water comes around the spit and opens into the bay and you never know what will come around the corner. The wind was starting to come up and soon there was chop on the water. The sun was going in and out behind the clouds and I kept forgetting to adjust my camera settings. I was really glad I had brought a coat and was even more grateful it had a hood on it to keep out the wind. I could see a western grebe far out in the bay as well as a couple of loons and I just kept my fingers crossed that they would come over to my side. 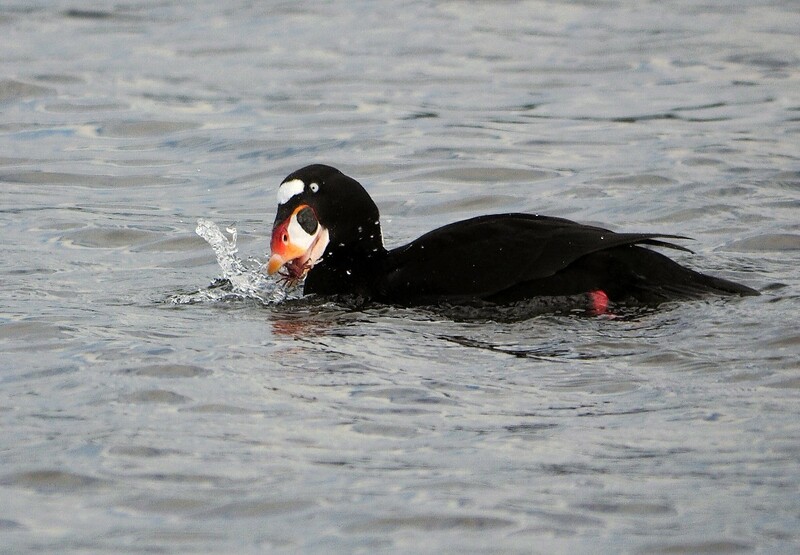 As I was looking out across the bay, I almost missed the surf scoter that popped up right in front of me as it came up from a dive. It had caught a crab and I was intently focused on taking a good picture when all of a sudden right in front of me not 15 feet away there was a huge WHOOSH! It sounded like when a whale blows but with none of the smell. 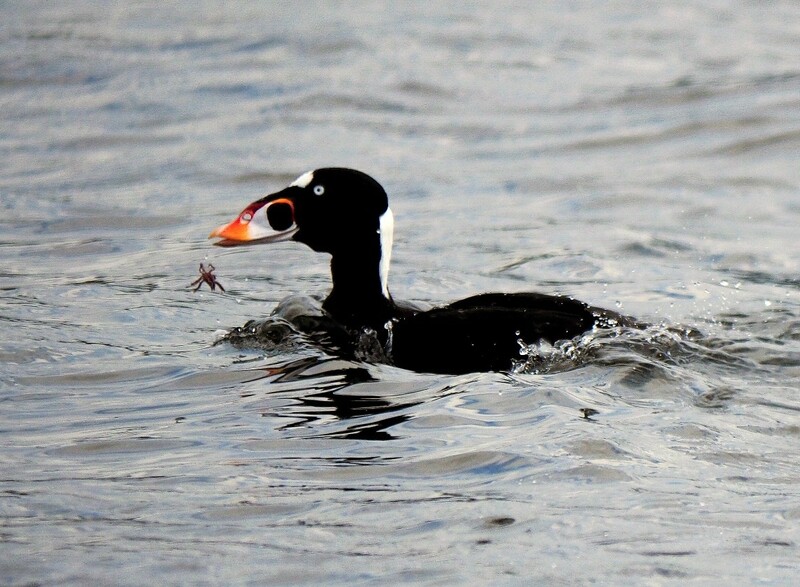 The scoter dropped its crab and I quickly moved my camera away to see what sort of creature was coming up from the deep, but all that was left was a large whirlpool of water where it once had been. I think I might have scared it more than it scared me, and I can only think it was probably a seal. But hey… you never know. 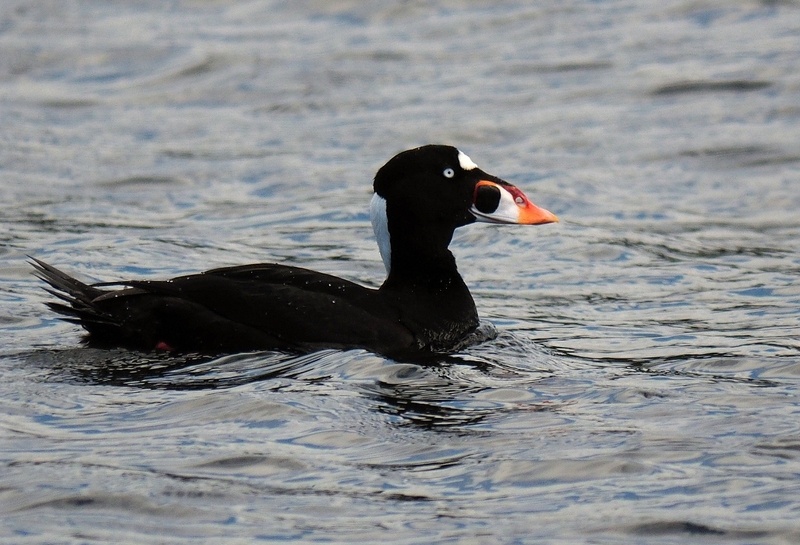 The beak on the scoter reminds me of a clown and you can see right through it. I have seen them catch whole clams before and eat them shell and all. Now that’s a digestive system that works. I was just getting up from the beach where unbeknownst to me I’d been sitting for 2.5 hours (numb bum and no watch) and I could see some harlequin ducks coming around the corner. So I sat down and waited until I saw them head offshore as a lady walked along the beach. Waiting a little longer just in case they changed direction I was looking over to my left when something caught my eye right in from of me. Can you believe it? 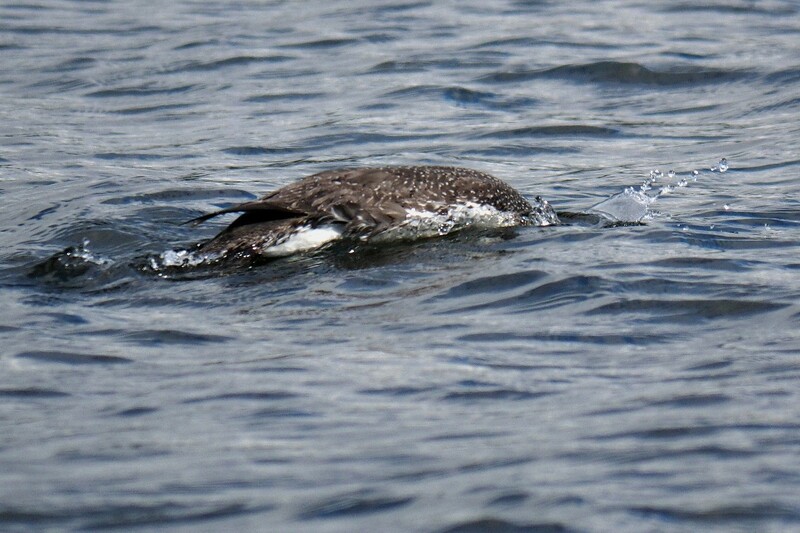 The loon that I had been watching across the bay came right up and looked at me for a moment or two and then dived below the waves. AWESOME! There are moments that make sitting on the rocks all worth while and this was definitely one of them. 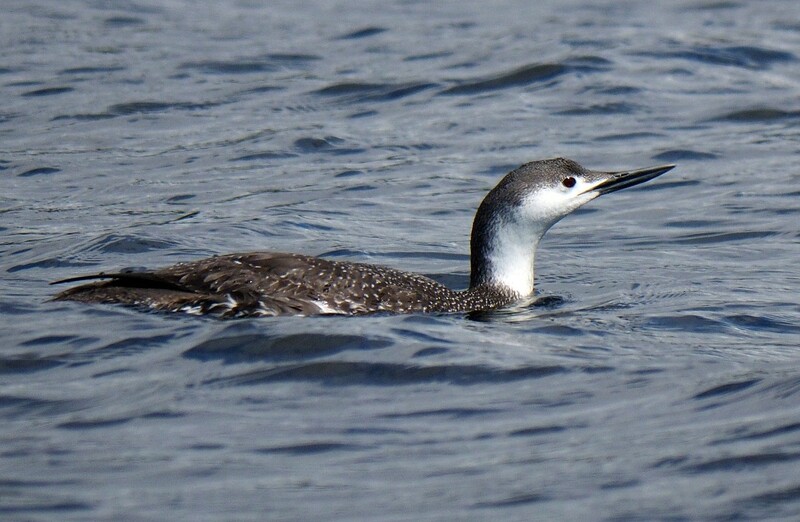 Note: This red-throated loon was still in winter plumage and should shortly transition into breeding plumage where they do in fact have a red throat. Here is a picture of one in all its colours on the Audubon website. 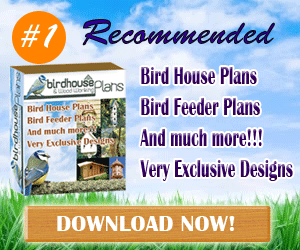 It is amazing how different their plumage looks.